Is Disneyland ever NOT crowded anymore? It’s a complaint we hear most often from guests to the Happiest Place on Earth. The lines are way too long, traffic and parking is a nightmare, and there’s barely enough room to breathe. What is going on? Is Disneyland just getting more crowded every year? Whether you blame it on the growth of annual passholders or the Star Wars frenzy, there’s no denying that Disneyland and Disney California Adventure are packed more often these days than not. Still, that doesn’t mean you’re out of luck if big crowds and long lines aren’t your thing. The dream of an empty (okay, almost-empty) Disneyland can still be realized; you just gotta go on the right day. Remember the days of a 10-minute wait for Space Mountain, a Main Street U.S.A. with some elbow room, and a security check line that didn’t move slower than TSA at the airport? Those days are getting harder and harder to come by. We rate those magical days as “Ghost Town” days on the Disneyland Crowd Calendar forecast, when crowds are light and the average wait time is only 10-20min or so. We’ve been tracking crowds at Disneyland for years now and the number of these days has been steadily declining. 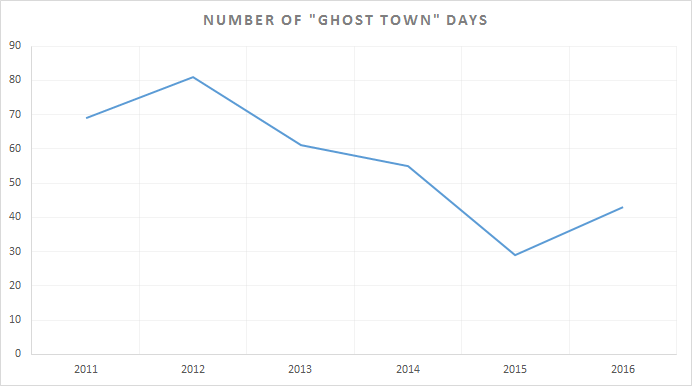 There were about 70 “Ghost Town” days back in 2011 and 81 days in 2012. That’s a pretty big number of low-attendance days, about 20% of the year in fact. Attendance at Disneyland started to pick up in 2013, however, and the number of empty days fell to about 60. In 2015 (the year of the 60th Anniversary Celebration), it dropped to just 29 “Ghost Town” days. Yikes. The average is now about 40 days a year, a 50% decline from just four years ago. Here’s the bad news: The off-season at Disneyland has definitely gotten shorter over the last few years. The good news? It’s not quite dead. The park is still not very crowded at all for about 10% of the year. The month of October has seen the most significant drop in “Ghost Town” days, down to virtually no days at all with the wildly popular Halloween season drawing big crowds every year. 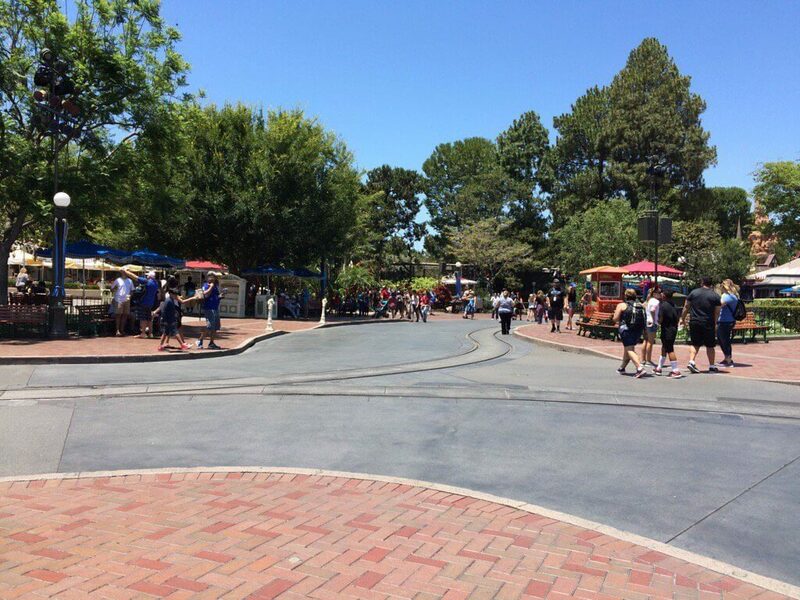 In the month of May, the Grad Nite events have also shrunk the number of empty days down to just a handful. 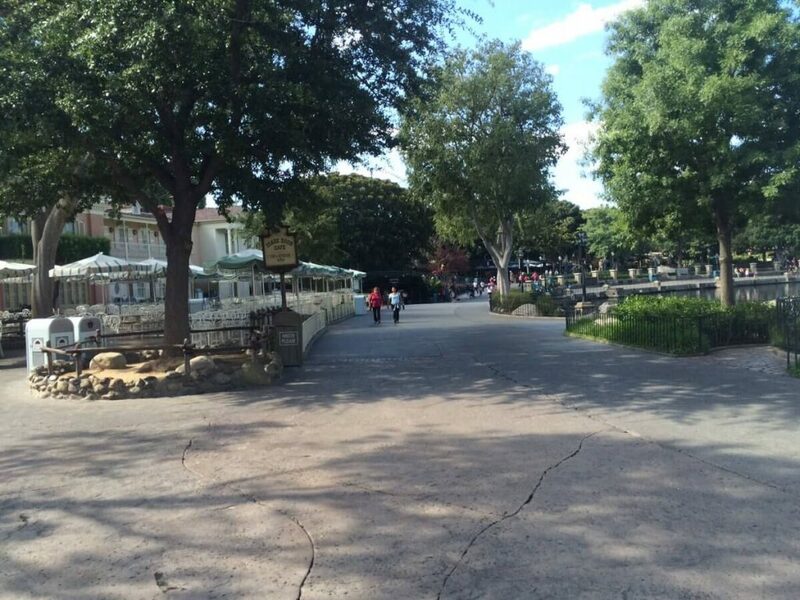 January is consistently the least crowded month of the year at Disneyland, averaging 12 “Ghost Town” days each year. After the holiday season ends (usually after the first week of the month), attendance drops sharply as vacations end and schools go back in session. The off-season continues into February, one of the least crowded times of the year at 10 “Ghost Town” days on average. 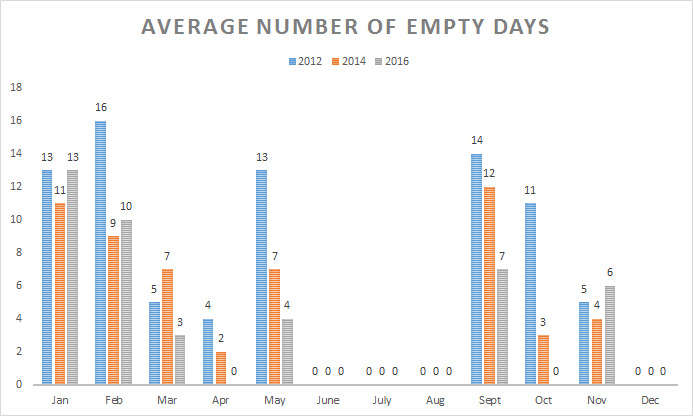 Attendance traditionally drops again right after the summer season ends in September, with an average of 8 “Ghost Town” days. For crowd predictions of upcoming dates, as well as historical crowd ratings, check out the Disneyland Crowd Calendar. When do you think is the best time to go to Disneyland? What has your experience been like visiting Disneyland during the off-season? Be sure to let us know in the comments below! The monthly payment plans for annual passes is the main problem. There are just way too many locals with APs now! It’s sad that the off-season is so short. Even in January-February, it’s not as empty as it used to be. It’s only going to get worse with Star Wars Land coming up. I’m disappointed that there are fewer Ghost Town days, but it’s good to know that there are still some days that aren’t too crowded. We are planning on going next September since we saw that it was pretty empty this year. Keeping our fingers crossed!